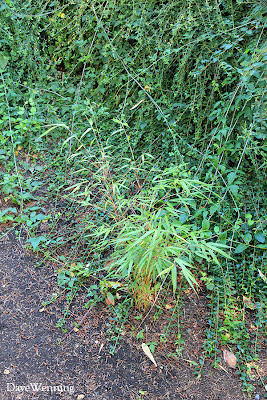 Last summer, this little clumping bamboo got me into big trouble over at Google+. It was Google's brand new social network where we early adopters were happily posting photos and talking about our interests. 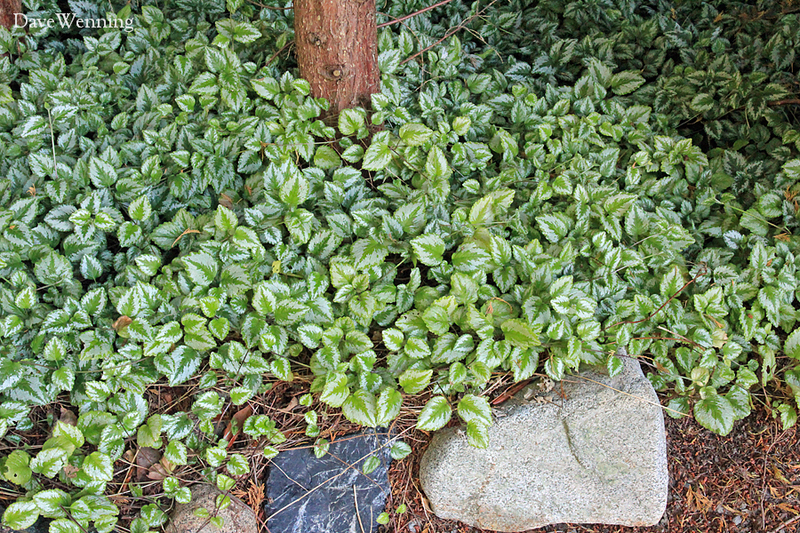 I had just planted this little clumping Borinda augustissima at the edge of the shade garden. I took a photo of it and posted it with a caption about a new addition to the garden. It was really just a practice post; no big deal. Well, jumping Jehoshaphat! My innocent little throw-away post got some surprising attention. 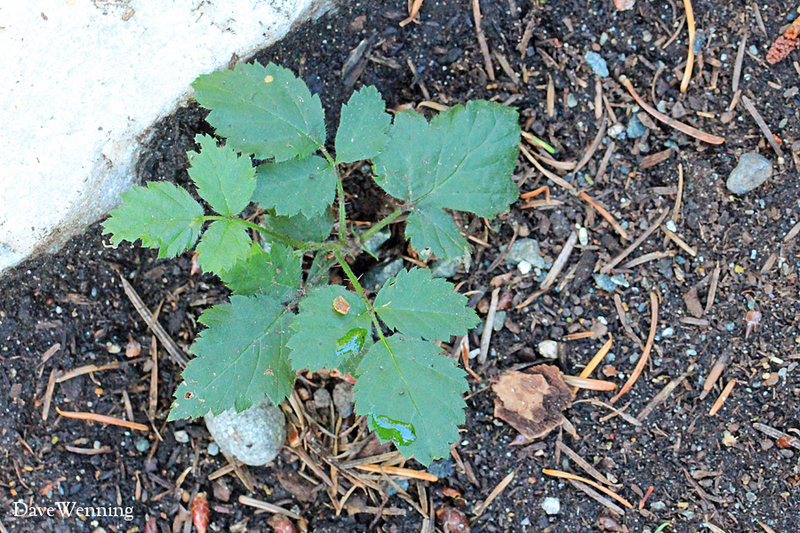 A woman took me to task for planting this "terrible, invasive plant." "Bamboo is outlawed in Florida." "Didn't I know that bamboo should never be planted?" I could sense the desperation in her words. It seemed an out-of-proportion reaction to such a small plant. In the friendliest, most polite response I could conjure up, I pointed out that this was not Florida. Bamboo was not considered an invasive plant here. In fact, references specifically described this one as non-invasive. She then informed me that she was a certified horticultural something-something. I guess I was supposed to whither in awe at this news, rip the little sucker out of the ground, and burn it on a pyre of wormwood. Well, that didn't happen. Instead, I just deleted the post. It wasn't that important. I didn't feel compelled to engage someone who struck me, frankly, as a bit nuts. Let's talk about the realities of my garden. After a year, I am surprised the bamboo is still alive. My soil is glacial till, sand and rocks held together with clay. It is totally devoid of organic material. When it dries out, it hardens like concrete and is called hardpan. I live at the edge of the Olympic Rain Shadow receiving about half the rainfall that Seattle gets. I also live on the shore of Puget Sound which delivers almost constant, salt-laced winds. Gardening here has some special challenges. I am an avid native plant gardener. I grew up in western Washington and native plants are a symbol of home for me. The woods and wetlands, ocean dunes and mountain meadows here are magical places. Native plants are an obvious choice for local garden conditions. I purposely left the giant Douglas and Grand Firs in the yard. Most people would have cut them down. I love it when one of the indigenous natives comes up in the garden on its own. I really enjoy the wildlife that seems to feel at home in my yard, in the same way I do. But I also enjoy growing cultivated plants, or "exotics" as some would call them. I admire Japanese gardens and I have tried to weave an Asian flavor into my garden. Bamboo fits the bill and It blends beautifully with the native foliage. I am attracted to almost anything with "japonica" in the name. In this regard, my only regret has been Lonicera japonica. Now that was an invasion. I do learn from my mistakes. After a year, the bamboo plant is still alive, and for me, that is success. It has not taken over the neighborhood either. Day of the Triffids did not come to South Fidalgo. The photo reveals that the little two-foot bamboo is not the problem. 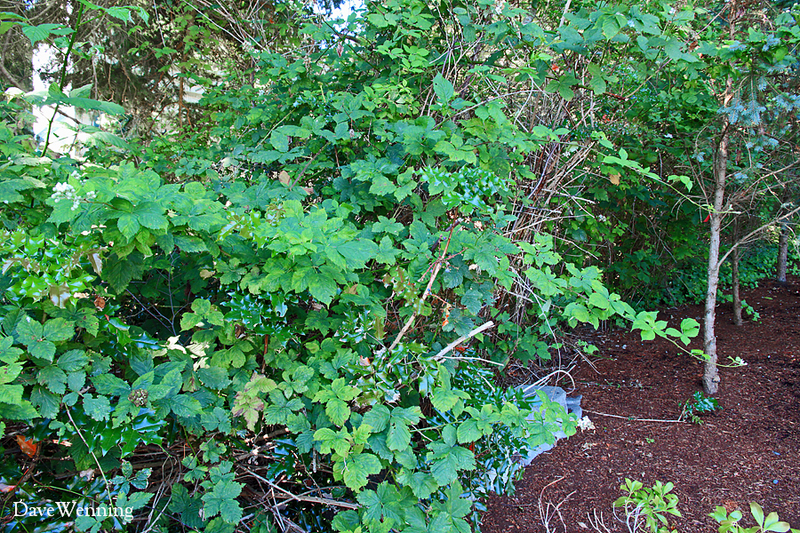 My problem is the neighbors' encroaching cotoneaster and the blackberry vines growing up through it. Now, let's talk about real invasive plants in the Pacific Northwest. This is a photo from just up the road. 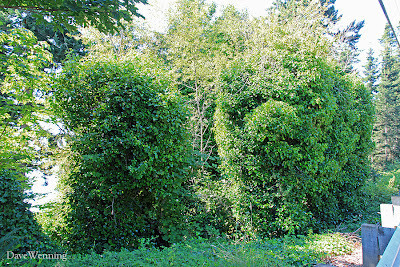 It shows two native Bitter Cherries (Prunus emarginata) that are completely engulfed by English Ivy (Hedera helix). Surprisingly, the cherries are still alive and leafing at the tops, a testimony to native endurance. 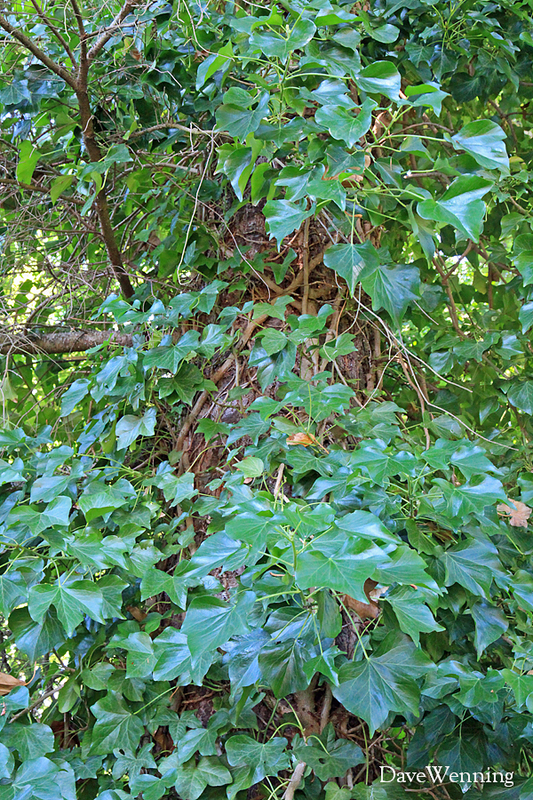 In time, they will be smothered or pulled down by the weight of the ivy. 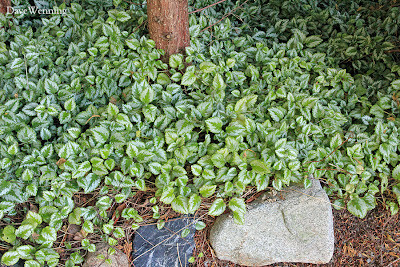 English Ivy seems to love our shady, cool, foggy climate and it is a real problem here. These photos of English Ivy are from my yard. The first two Douglas Firs are on the neighboring property. The middle photo reveals how the vines crisscross around the trunk of the tree. The third tree is in my yard. I have found that cutting the vines near the ground will kill the ivy. I don't pull the vines off the tree since this will damage the bark. Eventually, they will loosen and fall off on their own. Native understory plants like Sword Ferns, Salal, Indian Plum, Mahonia, Ocean Spray and Red-flowering Currant are quickly overwhelmed and displaced by the ivy. European Starlings relish the ivy's fruit. This unfortunate relationship only serves to extend the territories of both invasive pests. It has been planted by gardeners here in the belief that it will prevent the erosion of soil on slopes. The irony is that it does not. Instead, the shallow-rooted ivy will quickly spread and displace the native plants that would actually serve this purpose. 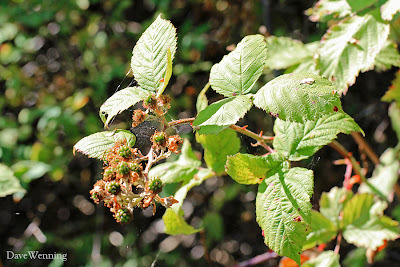 Then, there is Himalayan Blackberry (Rubus discolor, R. armeniaca) and this is how it starts. The plant was introduced by Luther Burbank himself. This seedling is perhaps a little more than a week old. The birds do love the berries and consequently, these seedlings come up everywhere. Try and pull the seedling and it will likely break off. The root may survive to sprout another day. One website describes it as one of the "ten most unwanted pests." 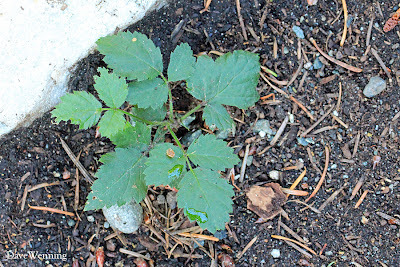 If left to its own devices, Himalayan Blackberry will quickly grow over everything it encounters. The canes can grow two feet a day. In two years, an entire yard could become covered ten feet deep with woody vines that have killer thorns. Our slow-growing native shrubs don't have a chance against this cheetah of the plant world. Turn your back for a couple of weeks, and the photo above shows the results. 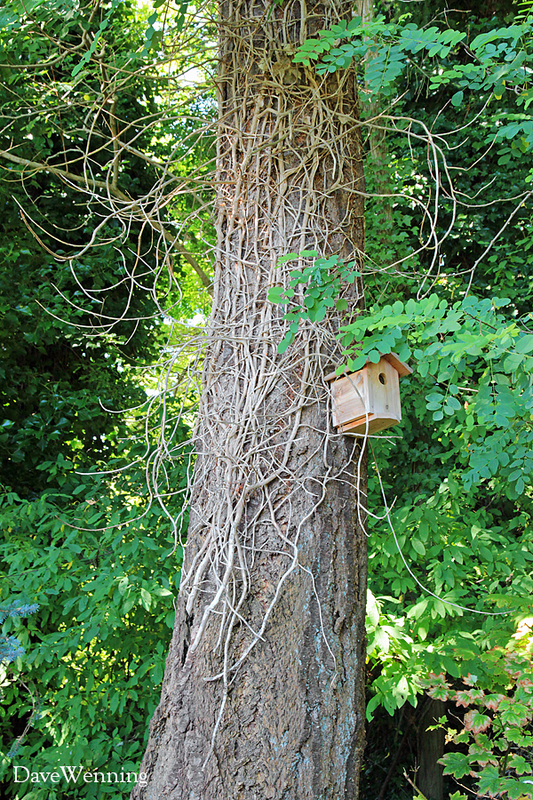 I have a Douglas Fir with vines that grew over its limbs 30 feet/10 meters above the ground. Nothing much can stop it. Where a vine touches the ground, another plant will spring up. The roots produce nodes that also sprout new plants. Local berry pickers refer to these as "Tame Blackberries" to differentiate them from the native "Wild Blackberry" (Rubus ursinus). Tame berries are not considered desirable by "elite" pickers. Our Wild Blackberry is more highly coveted because it makes better pies, cobblers, and preserves. Himalayan berries are dry, overly sweet, relatively tasteless and hairy. 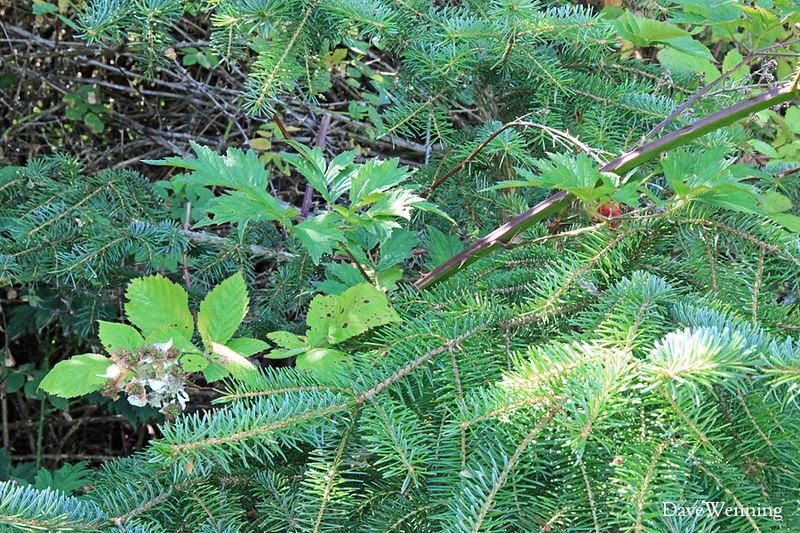 Cutleaf Blackberry (Rubus laciniatus) is another invasive non-native, here growing over a Serbian Spruce. While they can be equally aggressive, I have never found them to be as troublesome or persistent as the Himalayan Blackberry, also trying to overtake the conifer. This is English Laurel (Prunus laurocerasus) and it also likes to come up everywhere. Pulling up the seedlings is a constant chore. 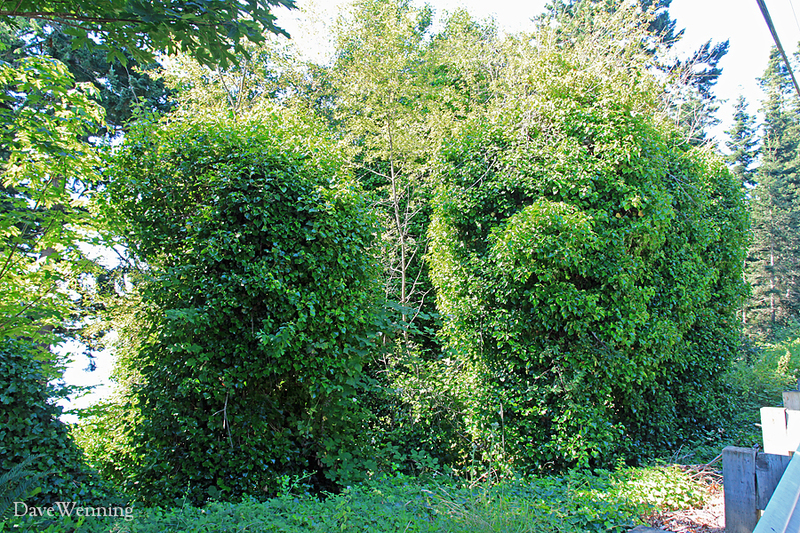 It is a popular, fast-growing hedge plant and unfortunately, someone in the neighborhood has one. Also unfortunate is its drought tolerance. They seem to be comfortable in deep shade as these two demonstrate. I will probably come to regret letting these plants grow in this otherwise empty spot. Perennial Sweet Pea (Lathyrus latifolius) is considered an invasive plant in some areas. I read that Thomas Jefferson is believed to have introduced it. It grows on the bluff next to the beach, but it seems to behave itself in this location. It is actually quite attractive scrambling over Nootka Rose. 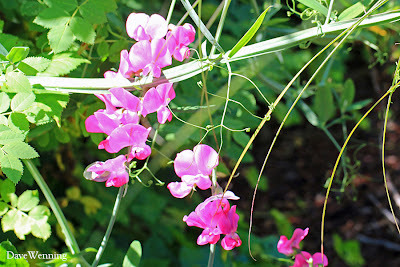 When the roses finish blooming, it is time for the Sweet Peas to flower. My garden does include the Whore of Babylon itself, the dreaded Gout or Bishop's Weed, Aegopodium podagraria. To some eastern gardeners, this is considered the Beast from Hell, the archfiend Antichrist of plants. It is not clear to me why. In my garden, it has been a perfect gentleman, hardly the rampant Destroyer of Worlds described by Easterners. In my garden, it politely keeps to its place. 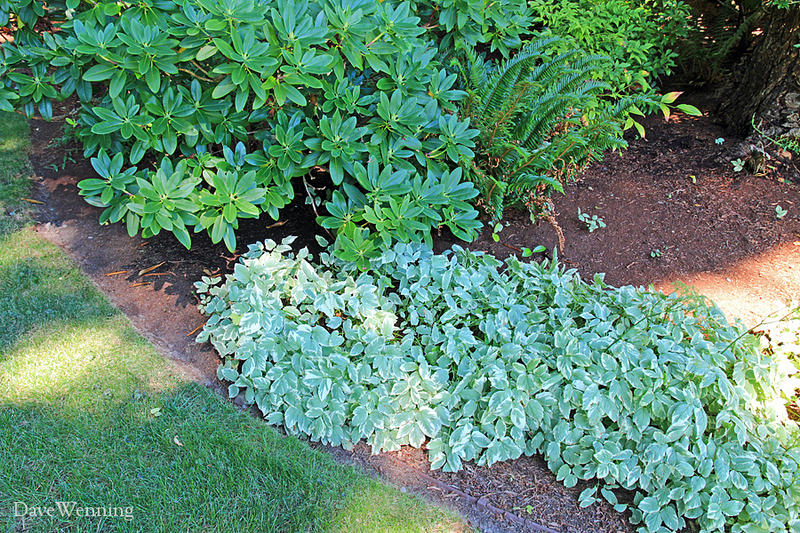 The variegated form offers a little brightness to a shady spot. It makes a nice contrast to the otherwise dark palette of the Northwest. It seems comfortable growing under the rhodies, ferns and conifers. I actually wish it would spread a bit more into the dark areas of the Douglas Fir understory. Yellow Archangel (Lamium galeobdolon) is another plant considered invasive. Again, it has become a welcome addition as a shady ground cover in my yard. This plant actually spread from the neighbors yard into mine. I suppose that could be called an invasion, but I don't find it troublesome. 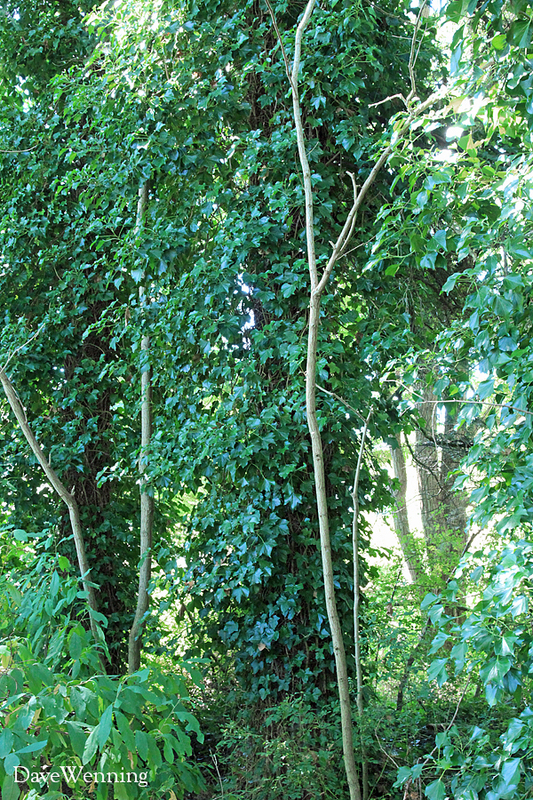 For several years now it has remained confined to a single shady area. Like Gout Weed, my difficult soil and tendency for drought probably keep it under control. Last year, I transplanted some to another tough spot. It is still alive, but hasn't spread one bit to fill in the area, as I had hoped. 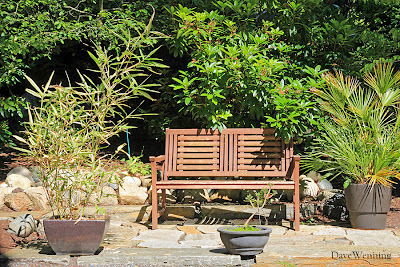 The sitting area at the edge of the shade garden gets some morning sun. 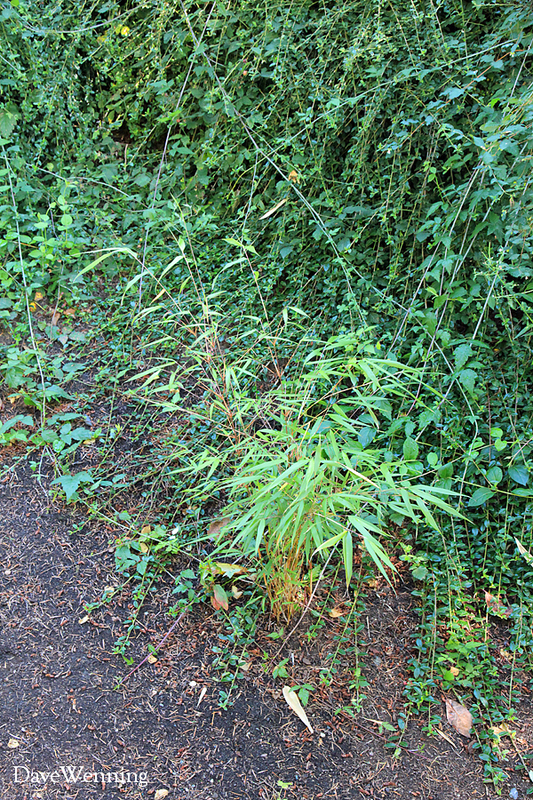 The wanderlust of a running bamboo (Hibanobambusa tranquilans 'Shiroshima'), left, is contained by a pot. The Mediterranean Fan Palm (Chamaerops humilis) tolerates our Northwest climate and provides the ambience of a Victorian parlor. Near the center, a young Japanese Black Pine (Pinus thunbergii) is just getting started. 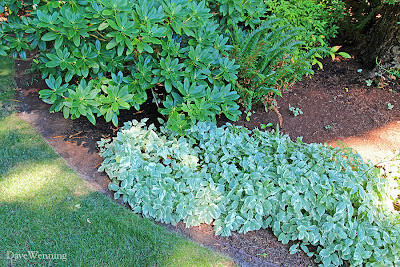 These are fun plants that add a little variety, interest and pleasure to the garden. Don't think for a moment that I am encouraging or condoning the addition of invasive plants to the garden. You didn't see that here. I am simply calling for a little common sense and regional understanding. This is a big country and it is not appropriate to make sweeping generalizations for every location. Most of the "native" plants and shrubs suggested for East Coast wildlife gardens, are not native here. They would be as exotic to us as anything available at the nursery. Butterfly Bush (Buddleja davidii), recommended by some gardeners, should never be planted here. 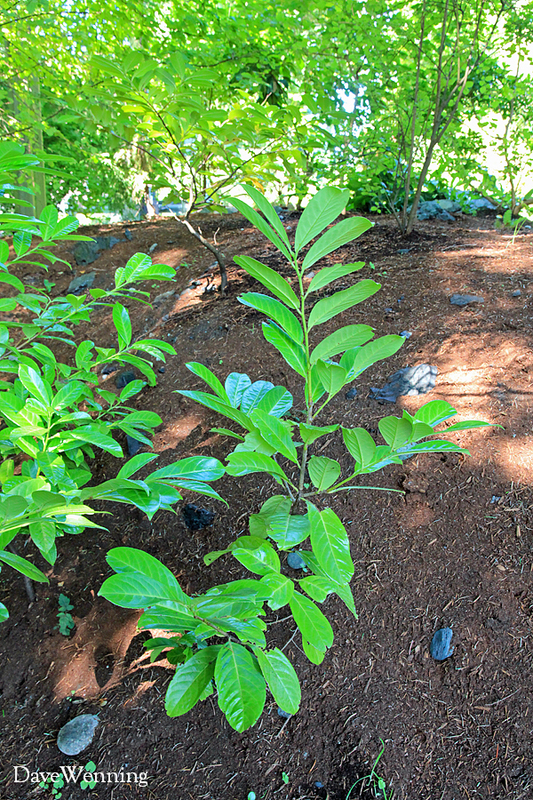 Oregon has banned its sale, and the Washington Department of Fish and Wildlife cautions against growing this invasive, noxious pest in butterfly gardens. For a regional perspective, the King County Noxious Weed List makes a good starting point. Bamboo, including the running type, is nowhere to be found in the lists. The acid soils of the Pacific Northwest are relatively devoid of bacteria, but rich in fungi. Many of our native plants have developed special relationships with these soil organisms. Plants from the Heath family, Ericaceae, including Salal, Evergreen Huckleberry, Pacific Rhododendron, Kinnikinnick and the wonderful Pacific Madrona are examples. Mycorrhizal fungi grow in and around their roots and provide nutrition, allowing the plants to thrive in our poor quality acid soils. The fungi receive carbohydrates from their hosts. They return the favor by providing water, minerals and disease resistance. We also have orchids that grow in total shade and cannot photosynthesize. They rely on their fungal partners for their existence. Our natives may not survive on other parts of the country that lack the appropriate fungi. Similarly, "exotic" plants from back east may find it difficult growing here. Every garden project, especially the wildlife or ecosystem garden, should begin with a survey of the indigenous plants of the property and its surroundings. You will find that natives and their cultivated counterparts will be the best suited options for a particular garden. Then add plants that make you happy. First and foremost, gardening should be fun. I suspect that poor certified bamboo lady, wagging her finger at total strangers, is not having any fun at all. Interesting post, Dave. I know I battled blackberries in my old Stanwood yard. I didn't realize there were different varieties. All I knew was they were a PITA. Have you seen the bamboo farm along Hwy 2 east of Monroe? Now that looks like invasive type bamboo.